Opera 9.0 has been released. The new features in this major release include BitTorrent support, content blocking, tab preview, widgets (small desktop applets), and a source viewer, among others. Update: First impressions. As a Firefox user I would very kindly like to keep this entire discussion free of Firefox vs Opera wars and the like. Congratulations Opera on an excellent release. that your not a firefox user as your stopping them from improving and comparing there browser of choice. There is nothing kind from blocking others to disucss and compare things they wish to , its a direct attack on free speech and the freedom to act of others. The Firefox and Opera user does not block the use of each others software , they do not stop there distributor from including both ( on the contrary they encourage diversity because they each think they are the best solution ). My answer to you and your likeminded friends : Go the f–k away from internet , its built on freedom and on free speech. How the hell is anything to improve in this world if where to be removed , the guaranteed rights , to compare to other similar solution ? Sorry if I offended any moron , I think you need to step of discusion sites , you will feel better. Always nice to have a new Opera release. “As a Firefox user I would very kindly like to keep this entire discussion free of Firefox vs Opera wars and the like. I am a firefox user myself. But you have to hand it to the Opera team for their all inclusive browsing software they make. With an inbuilt email client, news reader, and now widgets to boot and not to speak of their mouse gesures, it is surprising how they are able to restrict the size of the resulting installer to a nominal size. And even though I am a bit skeptical about their highlighting opera as the fastest web browser in the world, It is indeed a very nice one. I’ve always wanted to remain skeptical of Opera on various fronts (no idea why, we all have our biases), but in terms of speed, it really feels unrivaled. It may be that it just starts rendering faster so it feels quicker, but Opera just flies. And if you believe all the reports that it’s the most standards-compliant, etc. (and I do), it’s a rock-solid browser. I think it’s main barrier to entry is that because it is so customizable, it takes a long time to set up just the way you like. For those of us that use Linux, I think we’re fairly used to this sort of thing, but it could be annoying for Joe Average who just wants IE with tabs. Congratulations to the Opera team on the release. I was expecting another Beta release before the official launch of Opera 9, hopefully this isn’t premature and they’ve squashed all the major bugs. I seem to remember that the initial releases of Opera 7/8 had some significant problems and it took a few bug fixes before they matured. The new Opera 9 features such as content blocking and per-site preferences are very welcome and the speed seems excellent, I just hope the stability will be equally impressive. Even if you don’t use it, it is very likely you use several features which first came with opera (or you are using stone-age IE). So congratulations to Opera to be successfull delivering an all-time innovative and often forward-looking product! And a big thank-you, too! For tabbed-browsing, mouse gestures, and so on! You mean some websites have compatibility issues with Opera because they are coded for IE? Not really. Those aren’t issues with Opera, but with the sites. Most sites that break so so because they specifically discriminate against Opera. Only browser to render Acid2 test right, for what its worth. I’m pretty certain Safari got Acid2 test right first. iCab3 was second, and konqurer was third. Of this, I was not aware. I don’t use Macs or KDE so I never had the occasion to try them. I know Safari and I believe Konqueror had an issue with the scrollbar being visible when it shouldn’t. Not sure about iCab. The Opera CEO was ranting about how great it would be to get it first, but Apple got it first. I wanted to see Opera get it just because i like it. Just because Ive been using it since v5. I bought the student license @ version 7. It saved me alot of time with researching, etc. the notes feature helped so much. I even remember getting exited about M2, even if it was text only. Apple actually didn’t get it first. They were close, but had one piece wrong. when they made the announcement, I was using 10.2 and could not test their claims. I think my firefox just got replaced with Opera 9, the tango theme fits perfect with my gtk cairo theme. I also like the tray intergration, very nice. While I usually love all the features Opera includes in its releases, the bitTorrent client included just blows my….. well, you can imagine. Some will say simplicity is bliss, but damn it man, not a single option on the bitTorrent client?? and yes, I installed Opera, and it is NIIIICE. It is believed that football is called football because it is played on foot, instead of on a horse. On topic; Opera 9 looks like a really good release, and the BT-client is for the people who don’t need a fancy one. Do you have any special options for normal downloading? It seems that opera currently is the only full fledged super fast browser for linux. Mozilla firefox current situation is of a very heavy, unoptimized, but feature complete product. On all linux systems I found 3x more performance with opera than with firefox, and at least 10x speedier in view size change (100 to 110 to 120 …%) with mouse wheel + Ctrl change (everybody can try it to start believe). I used FC5 and RHEL4.3AS as linux OS to benchmark. I use Firefox for most of the stuff (I’m more used to it), but some sites just make it crash + coredump. I use Opera for those, which even in RC-status was more stable than Firefox. Will upgrade later. Although I like Firefox something’s really wrong with all Mozilla based WEB browsers ( Firefox. Mozilla,Seamonkey) on my fresh Fedora Core 5 installation ( Dual Pentium II 933 MHz 512 Mb RAM nVIDIA G-force ). They all use to crash when accessing http://www.osnews.con and some other WEB sites 9 ( http://www.nytimes.com for instanec)so I use Opera to open them. No debug messages no traces about what’s causing that behaviour.And all browser are celan , no plugins nor customisations , extensions etc. It really turned to be true : Opera is way to go on Linux. At least on MY linux systems ( four Linux boxes ). Hmm.. do you even notice that difference on such a fast cpu? But anyways, I also have the impression that Opera renders most web pages faster than Firefox (on a G4 1.33Ghz with 512Mb ram and a Radeon 9550, yay! for Opera supporting Linux on the powerpc). The main reason I switched to Opera is that the last firefox releases crashed a lot on my computer (and my brother saying all the time I should try it because it really is faster). Anyways, the second beta of Opera 9 crashed a lot on the new Slashdot layout. So, that made me switch back to Galeon, which has been my main browser a long time before Firebird. And I think it’s bad that the Galeon developers have chosen to stop development on Galeon and instead develop plugins for Epiphany. I really like Galeon. Anyways, coming back to Opera, I really like Opera too. It has lots of features which make me wonder why other browsers don’t have those. For example the fact that you can set certain settings for certain websites. That’s just wonderful for sites where you want to allow popups or sites where you want the user string to be changed to IE, or… On the other hand, I’ve noticed that Galeon renders fonts more beautifully than Opera. (I tried to make Opera use the Bitstream fonts, but there’s still something wrong it seems) On the other hand, Galeon seems to not correctly render certain Unicode characters, while Opera does render them correctly. Maybe there’s something wrong with my font configuration. And I also had a problem with Opera not rendering certain pages, while all the other browser did not have any problem with those pages. Well… maybe those problems are solved in the current release. I guess I’m one of the few people who actually like BOTH Firefox and Opera. I look forward to using this new release….as it’s a great browser…. Means I’ll spend my evening upgrading it on all my computers! /whine: now, what about an AMD64 native version? Willing to test here! I was fowollwing the weeklies and later on the dailies of Opera and I fear that it has been released too early. Many bugs have been reported some time ago that haven’t been fixed yet as it seems, like problems with streams. That’s just because you’ve followed the development and all those known issues are bothering you. All software is released with known bugs, so this isn’t “too early”. You are just so involved in the process that you think so. I just love Opera 9, it’s very fast, clean and polished. It’s got tons of built-in features that I use too. I downloaded the rpm for Opera 9 which works fine with 10.1, even though it only says 10.0. I originally used Netscape Navigator 4 and used it until Netscape Navigator 6 came out; I tried the new version and hated it. I tried switching to Internet Explorer and hated that too. I was saved by Opera back then, without it I wouldn’t have had a modern browser (I swear I would have stuck with Netscape Navigator 4) and I used Opera until Firefox became stable enough (if it wouldn’t have had tabs, I wouldn’t have switched) but kept Opera on my computer ever since. I like that Operas tabs stay there when I close the browser; I get those pages even when I open Opera without being connected to the internet. That feature and its Java support (I find Opera supports java better then Firefox) have earned Opera a permanent place on my hard drive. i have been trying/following opera since 2.11 … never got used to it: the interface, the rendering issues … anyway, i wish them the best, as competition is always good. Its interesting 23 posts and Its not been mentioned. Has the big E been replaced. Has it become so unimportant amongst todays techies. Its also interesting that after the strange first post, asking to stop cross comparison of browsers seems most strange almost as is Opera is above criticism. Blind devotion is stupid, but heated discussion is always healthy. I use OSNews to improve my understanding, and expand my knowledge, not blindly idolize a HTML cruncher of all things. 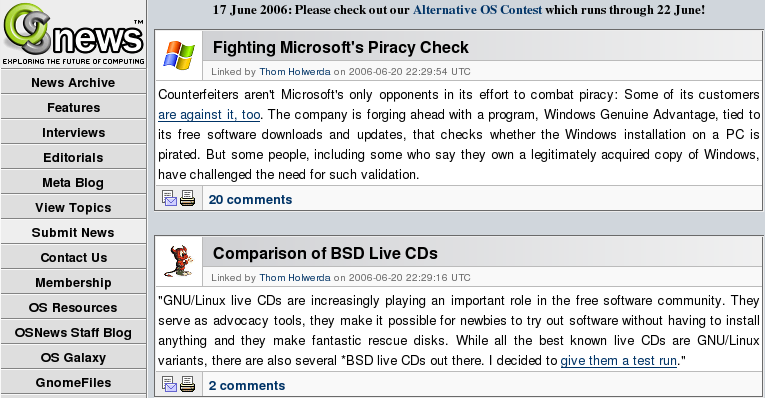 Has licensing also become a non issue for Linux users. Opera has a proprietary license. Its still an issue for me. I think that, among browser enthusiasts, IE has become unimportant. Most alternative browsers exceed IE in features and security and rendering issues are so old hat that we don’t even bother to talk about them. I think that the question browser enthusiasts ask each other is not “Do you use IE?”, but “What alternative browser do you use?”. In regards to the first post, I think the poster was trying to avoid a zealotry war. The topic is not on which browser is better but that Opera has released a new version. There have been comparisons posted but they have been mature and objective (for the most part). I thinks that’s great and shows the respect that the firefox and opera communities have for each other. As for the license issue, that’s a political decision. All of us are entitled to our own opinions on that matter. However, as an Opera user, I’d like to say thanks for expressing your opinion without being snobby or condescending about it. Its also interesting that after the strange first post, asking to stop cross comparison of browsers seems most strange almost as is Opera is above criticism. It’s that it normally devolves into a Firefox is better than Opera because it’s open source troll fest. OSS = The Best. Q.E.D. You can point out things like render times, the fact that Opera introduced several things that we now take for granted in Firefox, the fact that Opera’s download is smaller than Firefox and contains functionallity that is avalible in Firefox only after extensions are added, that Opera is much more configurable than Firefox, that Opera hasn’t had to patch certain malware vunerabilities that Firefox has had to. Nope. Points like that don’t matter. Firefox is better because it’s OSS and Opera is bad and teh ebil because they haven’t OSS’d their technology and nothing can ever be better than OSS, world without end, Amen. Nanananana I’m not listening to you, I’ve got my fingers in my ears, neener neener neener, OSS is best because I say so. It’s about as fruitful as trying to have a logical discussion with right-wing Christianists or Islamists, so you can see why the first poster was trying to pre-empt that zealot spewed horse$hit. BTW, posted with Opera 8.54, but I’ve got SeaMonkey open in my taskbar, too, and at home on my Mac, I use both Opera and Firefox, same thing on my Ubuntu machine. People who are aware of licensing, often choose an inferior product, because of that licensing. What makes the product the sensible choice is that for them and me its too much of a compromise to make. I know your trying to tie, someone who benefits from open source into some kind of obstinate 14 year but its not the case. One of my reasons for choosing an open source solution over a proprietary one is trust. The Web browser, is very intrusive its the connection between my private space(my home) and the outside world. As a computer person its a frightening piece of software to use. And you can forget about having a logical discussion with a Christian or a Muslim! It was like that time when I was talking to some Mormonists and Catholicists! After spelling, logic was the first thing out the window! Decaf, brother, decaf… and a dictionary. Also remember, a reason why zealots might bother you is because you’re quite possibly zealously against their zeal. Go have conjugal relations with yourself. Personally I find the most glaring difference between Firefox and Opera to be the smooth-scroll functionality of both. I’d moan about the memory usage too but I’m pretty complacent in that regard. CPU usage on a Pentium D 820 of mine though hits anywhere between 20%-52% with the smooth-wheel extension tweaked to give ‘as good’ performance as Opera’s default smooth scrolling. Something wrong there I’d have thought, but, YMMV. On a more on-topic note, congratulations to the Opera team on another fine release. I’m tempted now to actually sort out the Bluecurvesque theme (I made it for v.7x and the jump in interface style of v.8x made me leave off work on it). If you’re an Opera user and do use the theme, I apologise for it’s ‘development’ ending so abruptly. I went and downloaded it for my Mac… pretty sweet. And it is fast. Image loading seems snappier than safari and camino. I saw no glitches and was able to perform some basic tasks on DeviantArt, MySpace, etc. Looks good. I also like the simplicity of the layout. Just two small rows of tabs/widgets (by default). There is one thing I DID notice. Memory usage was up to 63 MB (actual, not virtual) after visiting 5 web sites and opening/closing 7 tabs. Maybe Opera copied Firefox’s memory leak “feature”? Have you ever sat there and looked at memory consumption of applications in Mac OS X? Pretty scary. I know applications “do a lot more” these days – with all the fancy GUI stuff – but I remember when 63K was a lot of memory for an application on my uVAX, let alone 63MB. I guess that isn’t too bad.. memory consumption up 10x in 20 years. The licence issue is not a political decision for most people. There are people out there who it might be, for me I don’t choose propritry software, out of fear. Its not just me, its whole goverments, even microsoft has to show the source to these people today. For otheres its that it works, or they know it will have support in years to come etc etc. Even Microsoft gave up on the Communism slur years ago. One can tweak the setting of network, user agent,etc by using oper:config, pretty cool for people who have high speed connection connection. It seems that opera currently is the only full fledged super fast browser for linux. on my machine konqueror starts up about three times as fast as opera, but page loading/rendering is about the same speed. after trying like crazy to figure out how to download a .tar.gz (or preferably .bz2, apparently the checkbox on the download page doesn’t work), i ended up at ftp://get.opera.com/pub/opera/linux/900/final/en/i386/static/, where i found that 9.0 final is apparently the build that i’ve been using for 4 days now (344). I wasn’t skeptical, but I was curious and downloaded it. It certainly appears to be faster than any other browser on my computer. It’s a wide margin too. Konqueror and Firefox don’t come remotely close. I noticed that OSNews fonts look different in Opera and Firefox. Anybody who’s got an explanation? In my PC, both firefox and opera are set to use the bitstream vera fonts. I watched this topic with an eager eye to see how Firefox shills would try to sneak in their usual snivelling, but guess what, one or two of the little weiners were right, this release really is premature. albertsons.com still will not recognize a login with this thing even though Opera 8 does, in fact I paused typing this to try Firefox, which I do not use, and yes I’m IN. I’ll try completing my order with Firefox and see what happens. I don’t blame Opera, I’m sure some Microsoft saboteurs have worked their way into their team, why else would Opera fail on sites that Netscape 4.74 still works on. Of course Netscape fails on sites that Arachne and PC GEOS browser “Skipper” can still view so what can you say. The big email providers like yahoo and Lycos seem to specifically break compatibility with Opera at regular intervals, I don’t know why nobody else ever mentions it. It’s the only reason I moved to Opera 7, and they’re going to drag me kicking and screaming into this release too. But as much as I hate the welfare-recipient mentality of the Open Source people I definitely took note when Firefox was able to play online games that won’t load under Opera, and now I see the online ordering works better too. It’s not going to make me a Firefox zealot, but it does p*ss me off. I just re-submitted the report. Maybe the original report fell throught the cracks somehow.